Mike said: “The Commonwealth is a fast growing market place with one third of the world’s population. “We know from experience just how vital international trade is and already have strong and successful trading links worldwide. 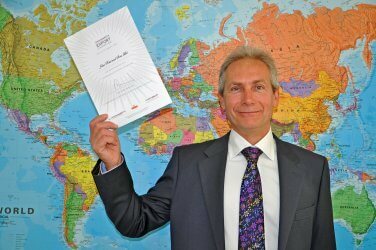 “It is an honour to become the first steel construction company to be named as an Export Champion. CommonwealthFirst was established by the Commonwealth Enterprise and Investment Council. Support for Export Champions includes high-level networking events and introductions, training, mentoring and tailored trade missions. We have the capability to design, manufacture, ship and erect entire steel buildings including their cladding and or glazing requirements anywhere in the world – from factory buildings in Mauritius and bridges in Africa to aircraft hangars and industrial buildings in the UK. We’re a four times winner of the Queen’s Award’s for Enterprise (International Trade). We’re also a member of the British Constructional Steelwork Association (BCSA), the Steel Construction Institute, ConstructionOnline, the Centre for Window and Cladding Technology, and the Steel Construction Certification Scheme. We’re accredited by the BCSA for the Qualified Steelwork Contractors Scheme for Bridgeworks (RQSC), by the Contractors Health and Safety Assessment Scheme (CHAS) and the UK Accreditation Service (UKAS) for its management systems. We’re also a CE Marking approved company. The Commonwealth’s roots go back to the British Empire although today it is a voluntary association of independent and equal sovereign states. According to CommonwealthFirst, shared language, complementary legal systems and business practice, helps to reduce trade costs by around 19% between member countries. It expects Commonwealth trade to double to US$1 trillion by 2020. Recent projects overseas have included Roseau Cathedral in Dominica and the Civic Center Sports Complex in Belize.